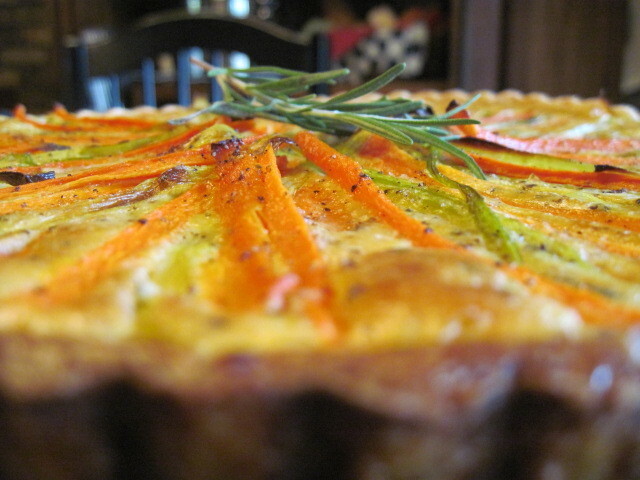 I simply could not wait to make this mustard tart featured on page 154 of Around My French Table by Dorie Greenspan. I loved everything about it when I was reading through the recipe and was excited to be using leeks, which I seldom use. I followed the recipe pretty closely however I did need to make a few small changes and as always, I did make a few errors where I had to adapt. 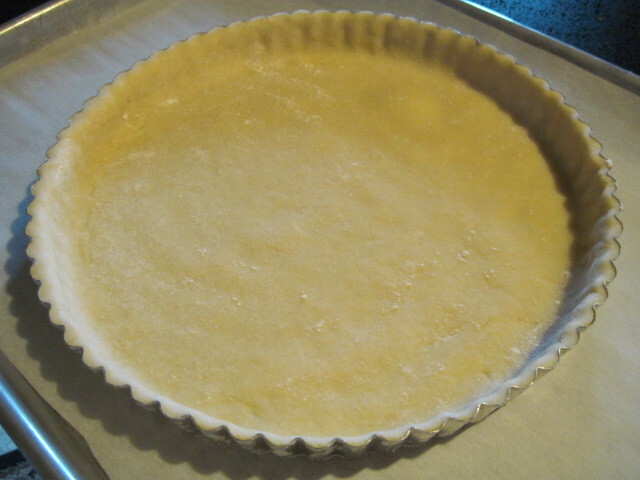 When I was making the crust, I needed to add more ice water before my crust fully came together. When it did, it was wonderful to work with. 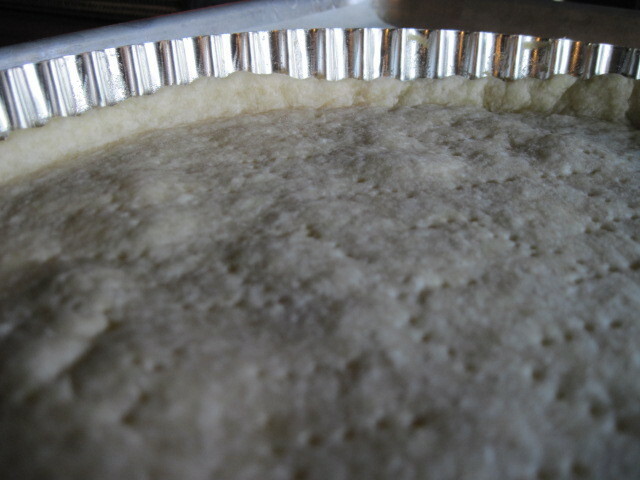 I made sure my crust was fully chilled before I baked it off, and to prevent the bottom from bubbling up and I docked the base of the crust. Next time I’ll be ready with beans because the docking didn’t seem to fully work and it still bubbled up a bit. When it came out of the oven, all I needed to do was press down on the dough while is was still warm and that seemed to take care of the problem. I was also worried about the shrinkage that had happened during the baking process. 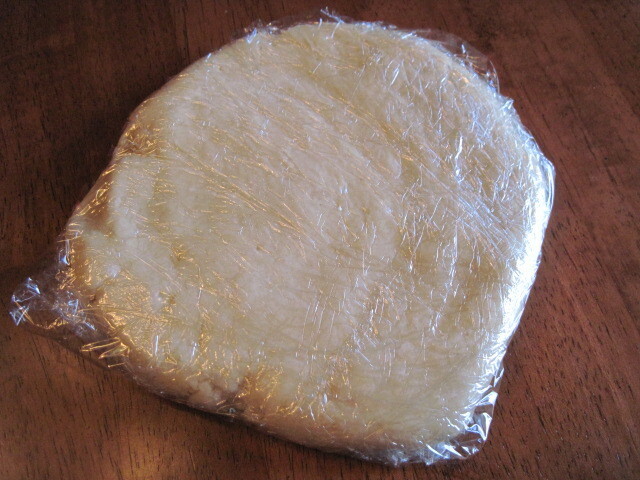 Is this typical of tart dough? Is there something I could have done differently to prevent this from happening? 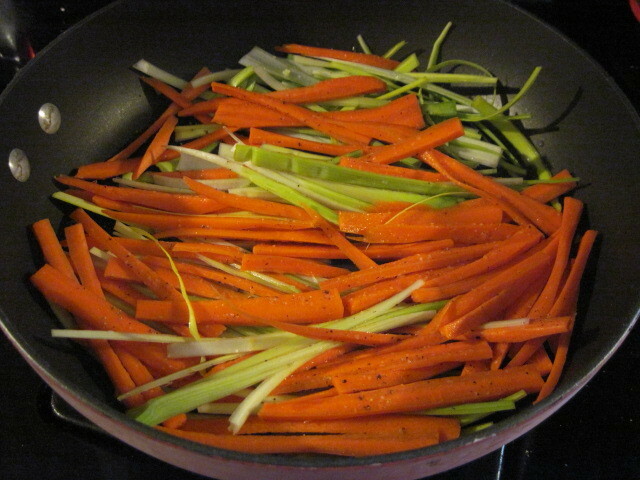 I lightly sauteed my carrot and leeks in a tiny bit of water and a scant bit of butter plus some salt and pepper. 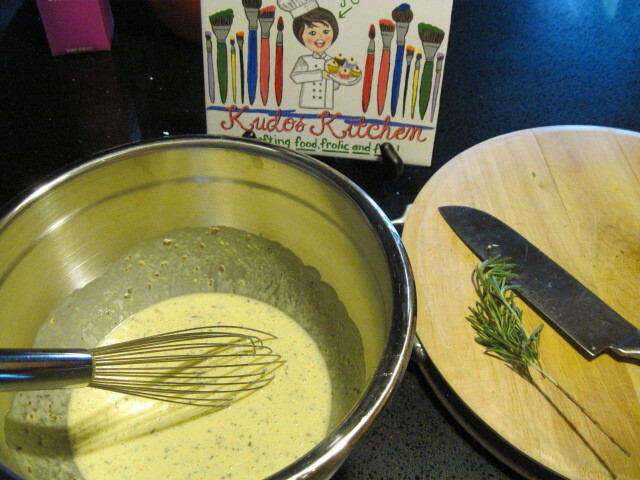 I forgot to infuse this mixture with the rosemary sprigs, so what I did was finely chop some rosemary leaves and added it to my egg, mustard and heavy cream mixture. I absolutely love everything about rosemary so there was no way I was going to leave it out. 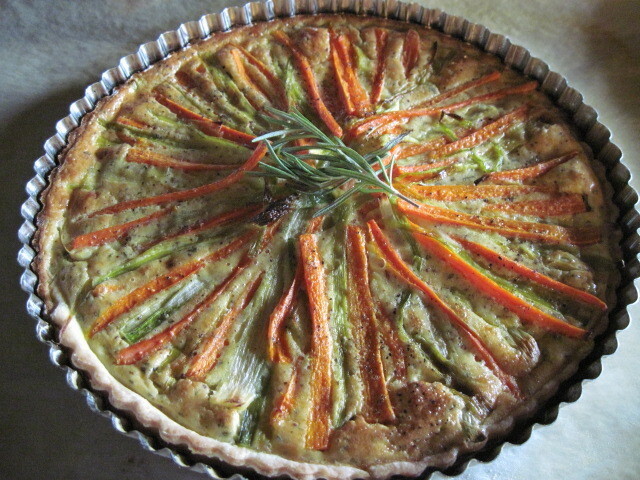 I poured the filling in the crust and artfully placed my sauteed leek and carrots in a spoke like pattern on top. Woo Hoo, it was turning out just like the one pictured in the book. Score! Bake the tart for approximately 30 minutes at 425 and wait for your home to fill with the most intoxicating aroma EVER! 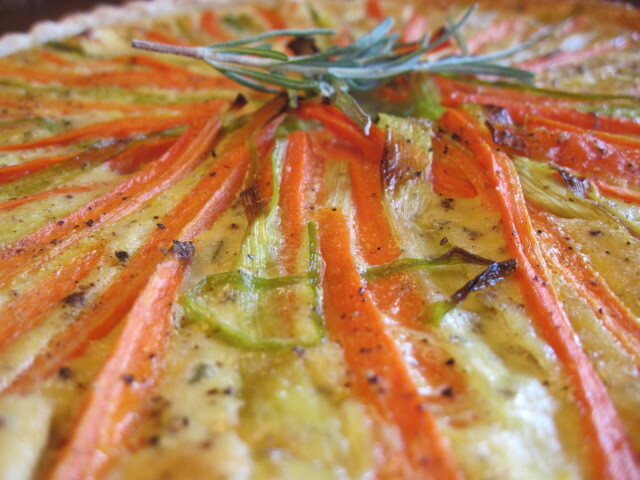 Having truly enjoyed the making and eating of this mustard tart, I do believe I’ll be making it for Christmas Eve this year as our family gathers to celebrate. It’s that pretty and that unbelievably tasty! Score! Thanks Dorie! Yours turned out so perfect! Just like the picture in the book. Beautiful! 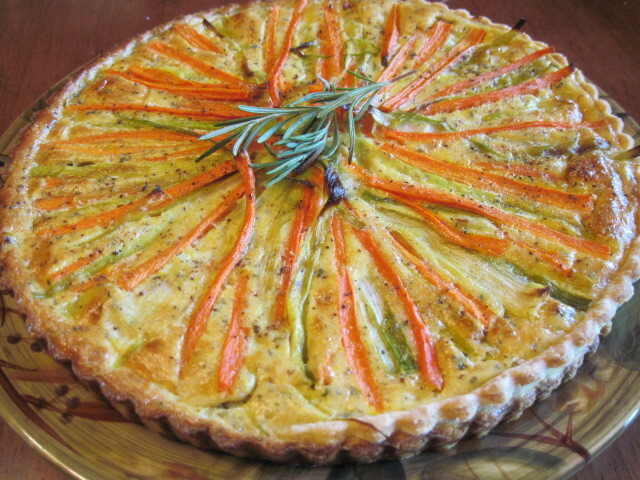 This tart is perfect for your site. So colorful and creative. I love it! This tart is perfect for your site. So colorful and creative. Looks like a big festive party. Love your site. Be back soon! You are right…it does look just like the picture in the book. Nice work. Wow Renee ~ Your crust…everything looks wonderful. You really seem to be enjoying these Fridays with Dorie. I'm certainly enjoying what you *present* here each Friday. 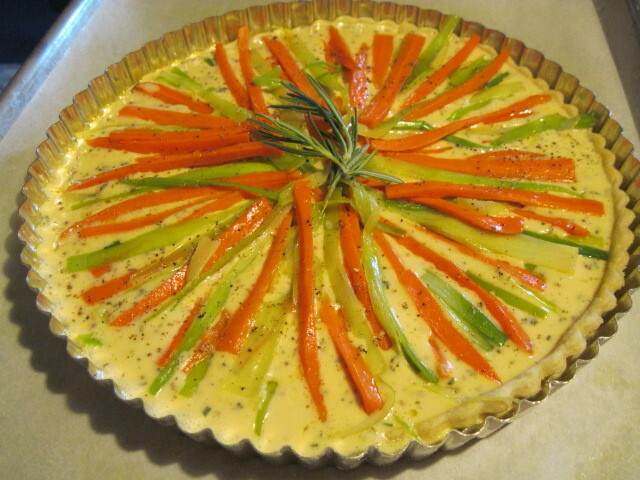 Love the vibrant colors on your beautiful tart! 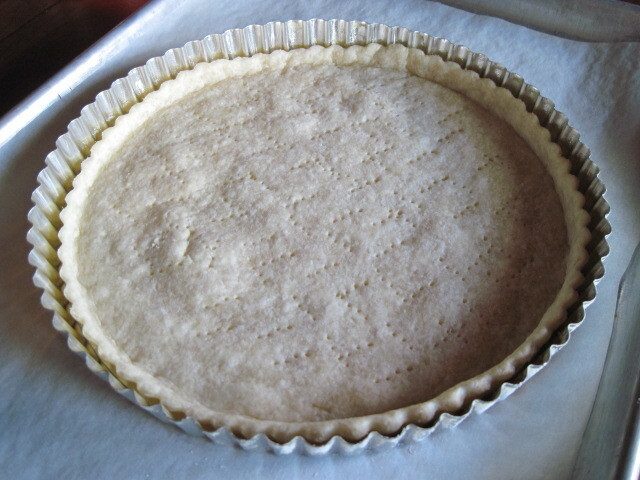 I like how you've rolled out the dough so evenly and lined the tart pan! I'm sure everyone else's crust shrank also; one thing I learnt from school is to make sure to roll out the dough in all directions to minimize shrinkage while baking. Worked for me so far but really, your tart is gorgeous as-is! Your tart is GORGEOUS. And your photos … love 'em! Beautiful tart!! Thanks for stopping by, cooking with this book is going to be so much fun. I have loved the first two recipes!! That's outstanding, Renée! So pretty and elegant! It looks absolutely beautiful. I can't wait to make it. I got the book today and made the Gougères. Next this tart, I hope. I may make the soup, first, since I had a request for soup. Your tart looks perfect! Just like in the book. Loving ur beautiful tart, am yet to catch up with it, and so want to now!! That is totally beautiful! I saw that on the back of the book and was intrigued, I must try it!